This year’s Battlefields trip took place on the 27th of September. A group of year ten and eleven GCSE history students set off on their long journey to Ypres, Belgium. It was an early six o’clock start for the students, however, they all managed to make it on time, many claiming that this was quite an achievement! Once in Calais (after delays due to missing their original time slot in the tunnel), the students still had an hour or so to go before reaching their hostel, which was perfectly named ‘Poppies.’ On route to the hostel, they stopped at the first cemetery, Lijssenthoek; this is a medical cemetery with predominantly commonwealth graves. The students learnt that, interestingly, it contained a grave of one of the only women to die within a ten kilometre radius of the front line. After the cemetery visit, they carried on their travels, arriving at the hostel where they quickly got ready for some well-deserved tea at a local restaurant. On the menu, was chicken and chips which Dilly Leak, a year eleven attending the trip, said was “quite nice and I enjoyed the choc ice for dessert!” Finally, after an exhaustingly long day, the tired pupils returned back to the hostel, ready for a good night’s sleep for another busy day ahead of them. The next day, the first item on the agenda was a visit to a set of German trenches called Bayerwalled, where everyone stood and listened whilst, unfortunately, getting drenched by the rain. However, the students didn’t let the rain stop them; they then went into the trenches and experienced the dark bunkers. Hill 60 was next on the list, and the guides explained the tunnelling and its significance during the war, which students said they found “interesting” and “eye-opening.” During late morning, they went on their first of two walks; here the guides explained to them how a 1915 battle would’ve worked. By this point, the students all needed refuelling so a stop for a sandwich was very much appreciated! 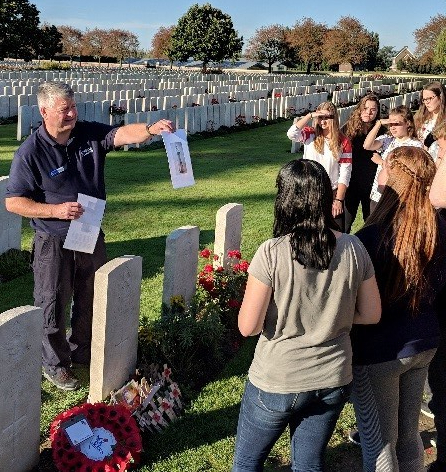 In the afternoon, the pupils visited another commonwealth cemetery, Essex Farm, and also the Langemarck German cemetery; students said this was “significantly different to the commonwealth ones.” Finally, they finished their visits of the day at the Vancouver Corner where the students looked upon a statue remembering the Canadian soldiers who fought through the gas when the British retreated. The last day arrived and the students went to the Memorial Passchendaele Museum. Here, the students were hooked as they were able to explore the different bunker systems and learn about the uniforms that the soldiers would have worn. One of the pupils, Izzy, even got to dress as a soldier! On the second walk of the trip, the students compared the different tactics of the war in 1917 to the 1915 tactics they learnt about on the first walk earlier tactics of 1915. Mr Murphy said, “I feel it was a very well-run trip, which was enjoyed by all and provided a great opportunity for learning outside of the classroom. All of the History teachers who went cannot credit the students enough for their behaviour and involvement through the whole trip”.